"Just wanted to let you know that your chuck roast was by far the best roast I've ever cooked. I cooked it the same way I always do and it was very tender and had a good taste. I will order some more on my next order for sure. So glad I got your flyer after we moved. Thanks again for all the good food I've been getting from you. We've been enjoying it." "We highly recommend Holy Cow Farms. The meat is amazing. Best steaks I have ever had. We have ordered multiple times and are highly satified. Will definitely be ordering more. Joanne is very pleasant to work with and will help come up with package ideas." "My family and I have enjoyed the all American freezer beef. The steaks were juicy and the roast delicious. Your taste buds will enjoy Holy Cow Farm Fresh meats." "We have purchased our beef from the Moshers for the past 2 years. It is fresh, tasty, affordable and SAFE! It gives me such a peace of mind to know that the meat I serve my family is literally raised just 'down the road' from our home. I know that there are not any chemicals pushed into the animals and that those chemicals are not pushed into my family. We are very excited to purchase other types of meat from the Moshers at Holy Cow Farm Fresh. You won't be disappointed in the quality and professionalism that Joanne and Paul have in store for your family!" "Holy cow! That's good beef! I fixed your cube steaks for lunch & my husband said repeatedly "This meat is really good! Outstanding!" So I am really looking forward to trying more of it soon & hope we will be able to get chickens & eggs. Yum! Thanks loads." "We got part of a beef and loved it! Sometimes healthy doesn't always taste as good, but that is not true here. Even my husband, who is from WY (cattle country), thought it was delicious. We can't wait to try a hog now!" "This is Matt Roller and I purchased a quarter of beef from the Moshers last summer. I got ground beef and choice steaks! I'm very pleased with the quality of the meat! The ground beef is lean and the taste is much better than any you can get at the grocery. Looking forward to my next purchase from them. Thanks Holy Cow!" "The beef is wonderful!! All cuts are tender with great flavor! I can honestly say that the steaks are more tender than the steaks that I have eaten in expensive steak houses! My daughter was shocked when she didn't need to drain the hamburger after cooking it. Taber and I look forward to the next one. (I was also happy with the processing house you chose and the way it was packaged.) Definitely one of the best purchases we have made." "Previously we had purchased beef from a butcher each year. It was okay. Then one year I ran into Joanne, who happened to mention she had some beef to sell. We said we would buy it. The first thing we made were the steaks. They literally melted in your mouth. It was probably the best steak I have ever had. The hamburger isn’t all fat when you fry it. The meat has more flavor than anything you will buy at the grocery store or even what we had previously purchased from the butcher shops. I truly believe it’s how Joanne and Paul raise these cattle. There is a difference between farm raised and family farm raised. I love not having to worry about what went into that animal prior to it being on my table. We are so excited to hear they are also doing pork! As long as they are raising and selling, we will be customers and I would highly recommend them to anyone wanting to know food can taste like. I cannot wait to place our order again this year." "I have purchased beef from Holy Cow and love it! The ground beef is so lean, there is nothing to drain at the end of frying. The steaks are very tender and lean as well! I love it!" "Hello! I wanted to let you know how much my family has LOVED the meat we purchased. What a blessing to know we are feeding our kids quality meat that they enjoy to eat. We are a young family of 4 so we truly appreciate your farm. I have shared our experience, communication, and positive feedback on meats with several neighbors. We hope they will join us in supporting you all. We look forward to ordering more quality meats as we need it. And we can't wait for the chickens! Much thanks,"
"We ordered a ¼ of beef from the Moshers and loved every ounce! The burger was excellent, the roasts were superb! Not only was it delicious, but we know it was raised the way it should be!" "I was looking for a way to purchase meat with no additives; packaged well; and fresh ; when I found a flyer in my door from Holy Cow Farms. I started just testing their products and soon found this was What I was looking for. Then I also tried the eggs and can not eat any other eggs than what they have.There are just two of us and the choices we have in amounts is ideal. My favorites are the chicken wings and quarters, the pork chops and ribs are great. We do not eat much beef but what we have had is great. The bacon is great. Have not made a bad purchase. I made a deal with my husband if he would stop eating sardines for lunch (the awful smell) I would get a beef tongue. So he is happy with the tongues (pickled) and I am happy with no smell! The ordering and picking up the meat is so easy. It is fun to see the Moshers and to meet their very responsible children. I really appreciate how this family works together. It is different to go grocery shopping and not having to spend time at the meat counter. PS. Our dog loves the bones!!! (Joanne I dislike writing but did this as I am grateful what you do.)" "My husband and I love everything about Holy Cow Farm Fresh! It is easy to order online. Love getting the emails reminding us of the delivery deadline. Time to shop! We know that we are getting real meat with no added colors or fillers. Our hamburger comes from ONE cow, not from a vat of beef. As our food supply in the US becomes more and more questionable, it is very important that we become informed consumers. I also LOVE having home delivery! I simply leave out a cooler in the morning and we have our order by the middle of the day! So simple! The emails from Joanne allow us to feel a part of the farm. Having grown up in town, I know very little about the day-to-day workings of a family farm. My husband and I also like that we are supporting a young farm family. We do not want the family farm to disappear. High density commercial production will never improve the health of America. Some of our favorite products are: hamburger patties, pork chops (had tonight! ), bacon, link sausage, quarter chickens...I have never ordered anything that we didn't love! I can't say that about the grocery store meat." "I buy my meat from a farm because it's pastured, so it lived a happy life getting to graze the land, be out in the sunshine and fresh air, like it’s supposed to. The feed it does receive is organic/non gmo, both very important to me. I buy from Holy Cow Farm because the meat is excellent! And your family is great, I am so happy that I found you. I feel that you truly care about the animals. My favorite products are…everything, hamburger is so tasty, sausage, all flavors are yummy. I just had your brats and they were excellent! Roasts, and chops are excellent as well, Turkeys were wonderful as well. I am so thankful for people like you, people who have a conscience and truly care about the happiness of the animals before processing. I know I am getting spiritually good meat buying from you." "I used to purchase all of my beef from the local grocery store. Then one day, I received a flyer in the mail from Holy Cow. I took a chance and placed my order. I am so glad I did! The ground beef is very lean and the steaks are tender and juicy. I will never purchase beef from the supermarket again. Thank you Holy Cow for bringing your farm to me." "I love that I know where our meat comes from, and the care that your family takes in raising the animals in a healthy, happy environment. I figure if you are feeding your family with the same meat, that is a really good testimony! It is wonderful that you deliver to West Lafayette each month — it is so easy to order and pick up on delivery days. We love the grass fed ground beef especially, but I haven't had anything I haven't liked. And last but not least, I love your Christian testimony and your commitment to working together as a family." "I'm a big fan of Holy Cow Farm Fresh. Their meats and eggs are superb in taste and freshness--and I know where all of it comes from. I admire and wholeheartedly support their embrace of a farming model that preserves the land and offers their animals a humane alternative to cages, immense feedlots and CAFOs." "I think the local farm provide higher quality meats than grocery store. Local farm also have more choices. Holy Cow has sustainable supplies and many choices .I think most of them are very good." "We have enjoyed ordering our meat from Holy Cow Farm Fresh for the past two years - great quality, and lovely family to do business with. Before we moved to Indiana from California 10 years ago, our cousins finished our beef for us, and a young lady in 4H raised a pig for us each year. It was good to know we were getting excellent meat we could trust. We actually had hands on with the beef because we helped care for the steers on our visits to our cousins' ranch. It was hard to go back to buying meat from a store when we moved to Indy. We were introduced to Holy Cow through a friend a couple of years ago and have not been disappointed. Not only do we enjoy quality meats we feel we can trust, but it is a pleasure to be able to help support a family farm business. One never knows what they are getting from the corporates,whereas from a family owned farm like Holy Cow, you feel they are putting their hearts and souls into the business. What a blessing to see how Holy Cow is thriving, and growing. We have tried many cuts of beef, pork, and chicken. I don't know that I can single out a favorite. It has all been great. The ground beef is just right, not too lean or fatty, good flavor. The different roasts we have tried have been excellent, tender and flavorful. We do enjoy the sirloin tip roast and pork loin. Sausages, bacon, eggs... you really can't go wrong. We are planning to try a bundle in the near future. Thank you Holy Cow! I tell people about you guys every chance I get." "We finally found meat that tastes like it did when we were kids! When we found out we could get good, healthy meat delivered right to our door AND help another family’s business? It was a no-brainer. Holy Cow Farm Fresh is the best. Excellent food and customer service. Worth it." "The day we knew we would be purchasing our meat and eggs from Holy Cow Farm Fresh was the day we stopped and talked with Paul at the Lafayette Farmer’s Market. We inquired about his farming practices and he was so steadfast in his commitment in caring for the land, his methods for crop production, stewardship of their animals and feeding their family and customer’s families with quality, responsibly raised meat and eggs. Holy Cow is a true small family farm - real food, well labeled, no guessing. Thank you Paul, Joanne and family for helping feed our family!" "I purchase your products because you are a family run farm and it makes me proud to be an American when I can by my food produced locally by the Attentive and caring Mosher family." Steve Strother, West Lafayette, IN "Thank you for the great service." "We "met" Holy Cow two years ago at the Lafayette Farmers Market when we bought eggs from their son, who was so excited to sell them to us. They turned out to be the best eggs we had ever had — the yolks were dark orange and the shells were hard, which let us know that the chickens they came from were healthy and we were getting a nutritious product! Over time, we have tried other products from their family farm and have not been disappointed. We get all of our beef from Holy Cow farm. We enjoy knowing exactly where our food comes from, that it is humanely raised, and that we are supporting a local family, who are very kind, friendly and humble. They have made it very easy to do business with, through their website and drop off locations. We will continue to do business with them as long as they are around!" "I am so pleased to have found Holy Cow Farm Fresh! I feel good about supporting our local farmers. The grass-fed beef is wonderful, the eggs are so fresh and sometimes you get a pretty blue/green egg in the dozen. (I save it for last. )I've just discovered the benefits of making my own bone broth and Holy Cow has a great selection of chicken, pork and beef bones. Thank you, Holy Cow Farm Fresh for sharing your quality products with us!" "Their great stewardship has led to great food and relationships! With increased knowledge about our food in recent years, combined with my love of animals (my Grandpa was a cattle farmer with hogs and chickens on the farm as well), I began to make more informed decisions about what our family eats — and from where it comes. The 3 top priorities for me when searching for our meat provider included 1) cleanly raised animals - no chemically treated or GMO feed 2) all animals humanely raised - no feed lots, they need to be pasture raised, well treated and respected as the gifts they are and 3) location - I wanted locally raised so we would be eating the freshest and have the shortest list of hands that it passes through before our table. Holy Cow Farm meets all 3 of my requirements! But also so much more — because of their delivery option, I have gotten the opportunity to meet and frequently chat with Joanne and Paul and a couple of their children. I admire their values and they have gained my trust as good stewards of the animals they raise. Our family favorites include their grass fed, as well as grain finished, ground beef! We buy it both in bulk and in premade patties for those days that we just need to quickly pull a meal together. We gobble up their eggs sometimes faster than they can keep them in stock (those girls have less productive times of years due to weather) and I currently have a roaster chicken thawing for tomorrow as I type! I should note, that a few years ago when I began buying from HCFF, their son Caleb was interested in raising chickens. I believe he started with his own money and his parents full support. I loved that the family supported this young son's vision-- so I started buying his eggs when they first started to produce. Now, I buy several dozen each month -- they just don't get any better! Nothing in a grocery store will ever compare! While those are our staples, I can also recommend the various sausages, kabobs, and skirt steaks!" Caleb's eggs and Canadian bacon: There is nothing better than Eggs Benedict for brunch. Porterhouse steak: One thick cut steak is a meal for the two of us. Medium rare is the way to go. Beef brisket: We LOVE these but for us alone, they are too huge. As a result, we invite friends over and make an evening of it. Just wonderful. Their on-line ordering and curb-side delivery service are perfect for us. Every order has magically appeared on my door-step exactly as requested. This is truly the meaning of 'Farm to Fork'. It could not be any more direct from Holy Cow Farms to MY fork!" "I was thankful to find out about Holy Cow farms when I went looking for a local source for my family's meat and eggs. For years I have been increasingly uncomfortable buying meat from any grocery store, knowing that it comes from large factory farms, where animals live in crowded and unnatural conditions. It is a financial commitment to buy from smaller local farmers. Their meat and eggs are more expensive. My family has compensated for this by reducing the amount of meat that we eat. We are not paying any more now for meat than we did before, but eating a bit less, which is healthier for us. And I know that the animals on the farm at Holy Cow are raised with compassion in an environment where they are able to engage in natural behaviors, which I believe leads to a happier lives for them. I was lucky enough to visit the farm and get to walk among the egg laying chickens out for the day in a field. They stampeded over to greet us with enthusiasm. What a delightfully nosy and happy bunch they are! I came away from the visit grateful that I have access to such a farm. I have enjoyed getting to know the Moshers as well, because as their customer, I buy directly from them. They are hardworking and friendly, and it is obvious that they love what they do. Their whole family is involved in the venture. Together they raise their animals with respect for their care and needs, and it shows in their product. Their meat and eggs are excellent. I recommend them with enthusiasm." Jo, West Lafayette "Looking for good, local food from a great family farm? Look no further! Holy Cow Farm Fresh has great chicken, pork and beef all raised on their farm with no hormones or antibiotics. They have a store on their farm in Monon, IN and they deliver to Zionsville once a month!" "Oh! What beautiful yolks! The chickens that laid these eggs must have been so healthy and happy!" "Mmmm, is this Holy Cow beef?" Or "What's for dinner?" answered with "A Most Honored Chicken." Maybe it's weird that we talk about our food this way, but we really do notice the difference in taste and can appreciate the high quality of life for the animals being raised at the Holy Cow farm." "We began purchasing from Holy Cow Farm shortly after getting an ad in our paper tube. I had no idea what to expect, but we have never been disappointed by their products. Knowing how careful the Mosher family is to provide excellence in their meat, poultry & eggs makes enjoying their great flavor even more of a pleasure. My husband & I especially enjoy the eggs - such color & flavor! 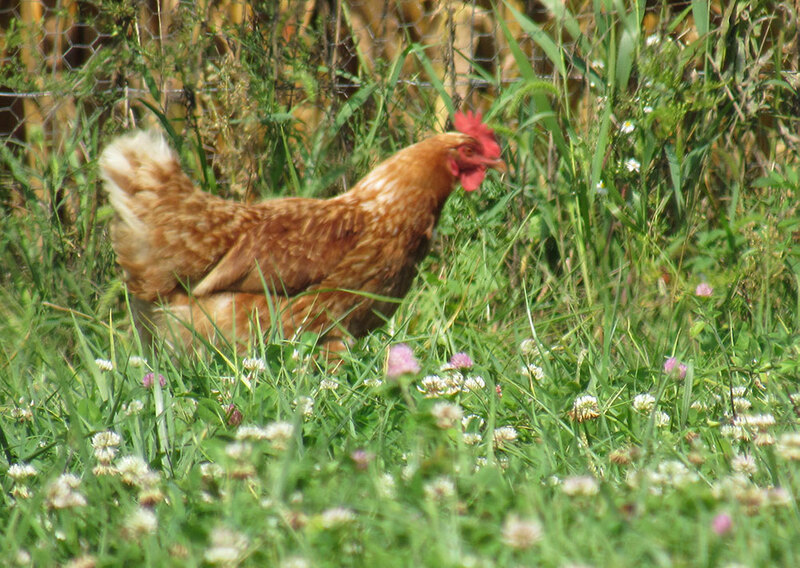 We are spoiled by them & are so glad when the hens get back to laying after the winter, as grocery eggs cannot compare. We grilled a HC flank steak recently & wow! Easily the best we'd ever had. I look forward to each order from them & also getting to interact with the Moshers. It is very encouraging to see a couple raising children to work hard & value the results of that work. Way to go, Paul and Joanne!" "We have been buying grassfed beef for quite a few years now from different farmers, and we really enjoy the flavor of the grassfed beef from Holy Cow farm. My wife also thought that pork from farmer only tasted like pork chops but not anymore, she was very pleased with the flavor and taste of the ham and bacon we got from this farm. We enjoyed the beef so much that we have switched our buying from a quarter of a beef at a cheaper price from a organic grassfed farmer, to Paul and Joanne's grassfed beef in more manageable sizes because of the taste and it not being soooo grassy tasting but actually a really nice beef flavor. We did end up getting some chickens from them as well, they were very clean tasting, it was a nice change from buying the ridiculously large chickens in the grocery store to a meat that was actually tasty and not oversized. Honestly we have loved all the meats we have purchased from them and will continue to drive to get our meat from them. In my mind, "it's well worth the trip" coming from Bradley, IL." 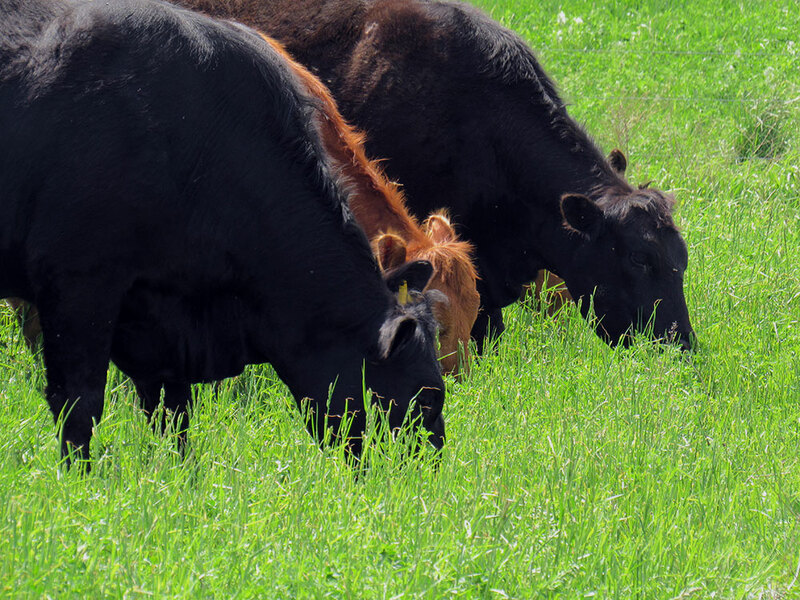 "We switched to Holy Cow Farms after not being 100 percent satisfied with other pasture raised farms. We are happy we did. We have tried the beef, pork, chicken and eggs and have been extremely happy with the quality of everything. Most recently we picked up a half hog. Some of the best pork chops I have ever had. Delivery is always reliable." "Our family has been trying to make some big changes to our health and trying to find affordable, healthy choices for our meats. It had been a difficult search until we found "Holy Cow" Farm. We were thrilled to find meats that are GMO free! Whether chicken, pork, or beef, they have all been delicious and the cost of the eggs is totally worth it too. The eggs are amazing and huge! There is such a great variety and I was also thrilled to find chicken hearts and livers at such am amazing price since I make my own dog food. I encourage you to make the drive out to this wonderful business, it will totally be worth it!" "My family and I appreciate and support the efforts of the Mosher family; we are loyal customers. Their meats and products are simply pure, clean, unadulterated, and most importantly, not chemically or genetically engineered. The taste is delicious and we know that we are eating nutritionally dense food, not "glow-in the dark" garbage pretending to look like food." "It's funny but not funny that forty years ago, without the rise of industrial farm factories (no competition); we wouldn't be using this language and the Mosher family would be one of thousands of small family farmers feeding America. Be kind to your body and health and get acquainted with the Mosher family and their high quality meats." Also check out our reviews on Facebook!